Thursday February 17th 1898 Will helped me wash in the forenoon. I was busy with sewing in the afternoon. It turned very cold. The boys came home from hauling the corn. The was 1684 bushels. Will went down to Johns after supper I read. Friday February 18th 1898 I ironed and did baking. Will went to town. John Garnett hauled hogs for Hart. The men came here to grind seed in the afternoon and stayed all night. 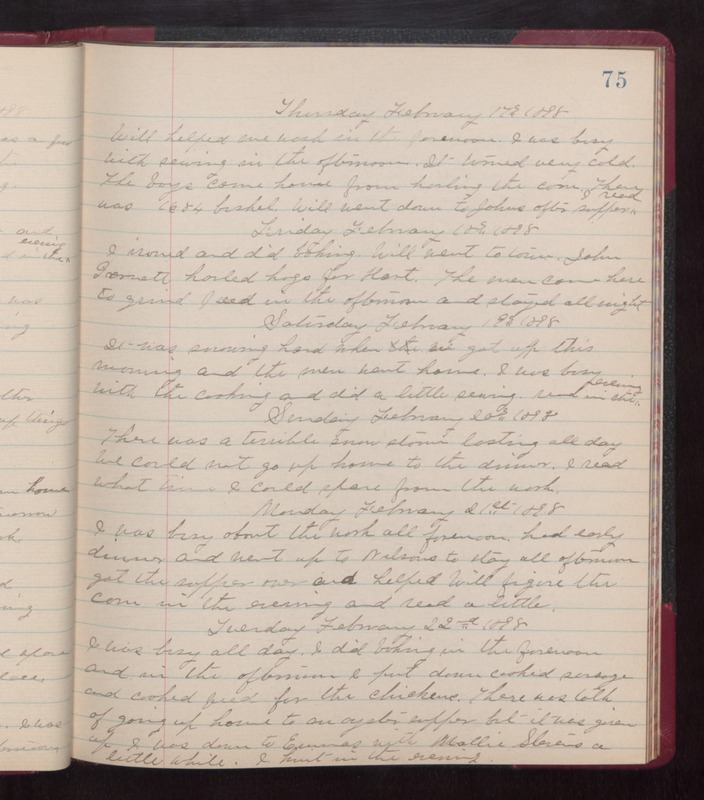 Saturday February 19th 1898 It was snowing hard when we got up this morning and the men went home.I was busy with the cooking and did a little sewing. read in the evening. Sunday February 20th 1898 There was a terrible snow storm lasting all day. We could not go up home to the dinner. I read what time I could spare from the work. Monday February 21st 1898 I was busy about the work all forenoon. Had early dinner and went up to Nelsons to stay all afternoon. Got the supper over and helped Will figure the corn in the evening and read a little. Tuesday February 22nd 1898 I was busy all day. I did baking in the forenoon and in the afternoon I put down cooked sausage and cooked feed for the chickens. There was talk of going up home to an oyster supper but it was given up. I was down to Emmas with Mollie Stevens a little while. I knit in the evening.